As Tony mentions, Isometrix is all about taking the toughest sequences from Yoga, and putting them in this routine. Absolutely zero impact, as the goal of this routine is to keep your body as still and motion-free as possible while engaging your stabilization muscles throughout your body. A perfect "recovery" or transition week workout, in my opinion. This routine is zero-impact, meaning there is no jumping, running, sprawling, crawling, or even pull-ups involved. It gives your joints and your body a break from all of the pounding it takes on the other working days. Having said that, this one is no slouch. You would think that just because you aren't running around or jumping up and down that you wouldn't get a great workout in. Wrong! This one gets you sweating immediately and keeps your heart rate up at a nice level throughout since all of your stabilization muscles are firing throughout. Speaking of stabilization, this routine targets all of those smaller muscles that help you balance. This is great, because we tend to focus too much on our large muscle groups which can lead to muscular imbalances. By focusing on working on our balance and our stabilization muscles, we can then focus on doing other exercises safer and much more efficient. Some of these balance postures can be dangerous for those of you who do not have very good balance. There are some modified exercises here, so don't be a hero and let your ego get your hurt. Not a huge con, because most of the balance stuff here is pretty safe, but there are a few exercises at the end that increase the risk of injury, so be careful! This one is all about balance and focusing on stabilization. That is not going to please everyone. When P90X2 first came out, I heard more belly-aching than I'd like to admit, from people who were too concerned about working on their biceps and six-packs. 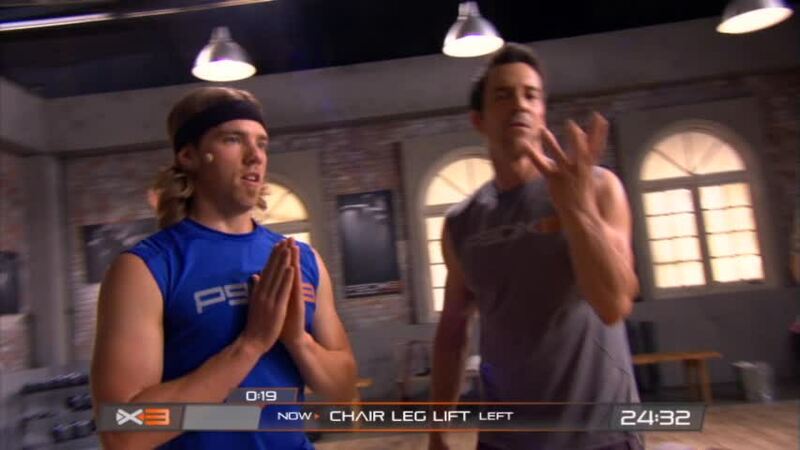 The reason why so many people disliked P90X2 is because they felt as if they weren't getting a "good enough calorie burn" due to their inability to balance. Truth is, however, and a secret that only a select few seem to "get," is that if you focus on these types of workouts - you know, the ones that work on your weak spots - you will be able to be a better, safer, more well-rounded athlete. Don't want to be an athlete you say? Well athletic people have better body compositions, are better at exercising, and generally have much better, more coordinated movement patterns. If your balance isn't very good, you will struggle, plain and simple! I have pretty good balance, so I didn't find this routine to be too incredibly difficult, but that doesn't mean I didn't enjoy it. In fact, this one is immediately going into my recovery weeks from here on out. I love working on my balance, coordination, and flexibility because it makes me a more well-rounded athlete (see "Cons" section above). Even if you have great balance, there are a few subtleties here that you can use to 'push yourself' a bit more, such as increasing your range of motion in your postures, closing your eyes, etc. I will use this routine to consistently work on my balance and coordination while also improving my range of motion and flexibility. Some of you will find this routine very hard, especially holding these postures for 40 seconds each. This routine is not difficult in a way that has your muscles pumped and your heart rate soaring, but rather, tough because it works on your weaknesses and forces you to focus and balance. By my count, there are 15 exercises total. The workout follows a general pattern of alternating a plank-type balance posture with a standing balance posture, also alternating left and right. So, for example, you may do a plank exercise with your right arm raised, followed by a standing posture on your right leg, both repeated on your left side. Every balance posture is held for 40 seconds. There are 7 'sets' like this total (14 exercises), with one last balance "burnout" at the end. I really like the sequencing of this workout because you are given sort of a break with the standing balance postures as I found the plank postures to by much more physically demanding. Again, the low-impact nature of this routine makes it a perfect recovery week routine in my opinion. As usual, I would preview this workout before getting started so that you have an idea of what the sequencing is like, not to mention what the plank postures are like. Standing balance exercises aren't as bad because you can stand and see your TV screen while working out. Planking exercises, on the other hand, are tougher because you are face down on the floor. I also highly recommend having a mirror nearby to help you focus on correct form. If all of your mirrors are wall-mounted, I would go and buy yourself a cheap full-body mirror and place it on your floor near your workout space to help you make sure you are engaging and keeping a straight body throughout these exercises. When doing the side plank exercises, if you are able to do the "leg raise intensifier" (as shown by Tony in the picture above and to the right), then follow this simple, yet difficult tip. Raise your heel as high as you possibly can, but point your toes towards the floor. This simple little subtlety engages the gluteus medius, which is a weak spot for a lot of people that can lead to knee instability. This may be difficult for a lot of you to hold this position, pointing your toes to the floor for a full 40 seconds, but keep working at it, as there are tremendous benefits to having a strong gluteus medius. This is definitely going to be a "love it or hate it" kind of workout for most people. If you have a decent amount of balance and stabilization strength/control, or have the patience to improve at this routine, then you will enjoy it and see the benefits from it. On the other hand, if you struggle with it and are stumbling all over the place with your balance and control, hopefully you don't just write this one off as "stupid." I really enjoy this routine, and as I said previously, I will be implementing this one into my recovery or transition weeks for the foreseeable future!